With the release of the first Associated Press rankings of the season last week, we here at Crazie Talk have put together four sets of rankings from our writers and compiled them into the Official Crazie Talk Preseason Top 25. The #1 team in each poll receives 25 points while the #25 team receives 1 point. The sum of the totals is displayed below. Others receiving votes: Minnesota (3), Notre Dame (3), Syracuse (3), Illinois (2), Siena (1). The basketball universe respects Duke undergrads for the absurd things we do to watch basketball games in Cameron Indoor Stadium. From sleeping in flooded tent cities to burning massive wooden benches, Dukies “blow off steam” in ways that the average American college student wouldn’t consider even at the pinnacle of inebriation. 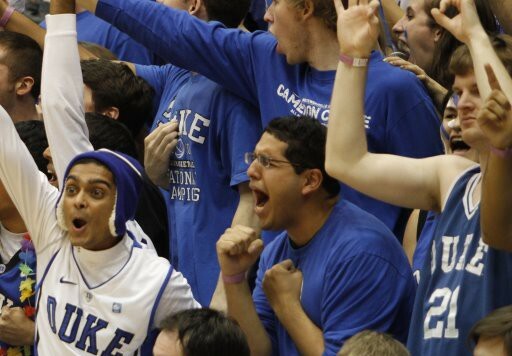 Thus, the Cameron Crazies are widely considered the best and most creative fans in college basketball. But there’s one thing some Blue Devils may not know—the Graduate students just might be the craziest of the whole lot. This past weekend, students from Duke’s 60 graduate programs flooded three Blue Zone parking lots with trucks, tents, DJ Equipment, and of course, a healthy, fun loving attitude. Typically, each graduate program carves out a section of turf and sets up dozens of tents, or in the case of the Fuqua Business School, rented RV’s. Like K-ville, campers must complete mandatory tent checks signaled by blaring sirens. If you miss one tent check, you’re out of the running for one of the coveted 725 grad student season tickets. Typically, students enter the lottery in groups. For example, a group of 30 law students will camp out together. When the names are drawn, 15 of them win season tickets. Those 15 have their choice of games, but the home games are “divided” among the original group of 30. The system satisfies everyone. Jonathan Page, a second year Divinity Student, observed that the high stakes of the weekend “makes for a more intense moment” when a tent check occurs. At the sound of the siren, the mass of students horded around the white check-in tent, arranged alphabetically by last name. After checking in, students dispersed back to their activities, which included a Guitar Hero tournament, basketball shoot-out, and enormous projection screens erected to watch college football and classic Duke basketball games. The weekend is planned by the Graduate and Professional Student Council’s Basketball Committee. Campout co-chair Mark Kohler, a Ph.D. candidate in chemistry, said that the weekend took over five months to plan. Kohler noted that since graduate students have different schedules than undergrads, the idea of “sleeping outside for weeks” is simply impossible. “People are teaching, grading papers, we’re all busy.” He also observed that Grad Campout has its traditions just like K-Ville. “Some people have come back for ten years running.” Traditions like creative t-shirts, beer pong tables, and late night karaoke lend the weekend an aura of intensity that would impress even the undergrad tenants of Tent 1. The grad students may not occupy the marquee spots in Cameron, but as Campout Weekend ’09 demonstrated, there’s no doubting their crazieness. On the same day that he was inducted into the Army’s Sports Hall of Fame, Coach Mike Krzyzewski stood before another group several hours after Duke football’s 35-19 win over the Black Knights in West Point. "We need to have an edge..."
Around 9pm on Saturday, Coach K and the men’s basketball team filed into the Blue Zone for Krzyzewski’s annual speech to the Graduate Students. The team donned the official Grad Student t-shirts, and K took up the microphone before an ocean of students seated on the pavement. 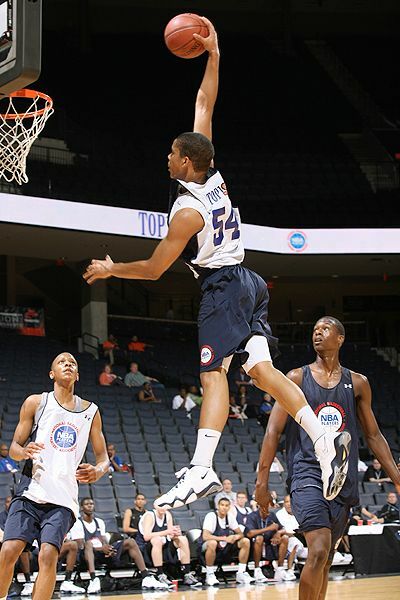 He began with introductions of the “new guys”–freshmen Mason Plumlee, Ryan Kelly, Andre Dawkins, and Seth Curry. He noted jokingly that Dawkins is “going to turn 18 this month.” A voice then yelled out to Andre, “Show me your I.D. !” “Just don’t find one for him!” Coach K replied. The trademark wit continued through the talk, but Coach K was sure to inform the graduate students of Cameron’s new developments. To the cheers of the crowd, K announced that the end zone opposite the graduate section, usually occupied by padded seats, is now part of the grad section. The new seats push the number of season tickets from 700 to 725. He reiterated throughout the speech that “the season starts tonight.” Trust us, Coach. We can’t wait to see what the team can do in your 30th year at the helm. Check out the video of Coach K’s speech below, which contains some language. For more scenes from the crazie weekend, check out our Photos page. – A student asked: “Are we going to beat UNC at home this year?” To be brief, K was not too pleased by this question. –When Coach K mentioned practice, several students yelled, “You talkin’ bout practice?” mimicking Allen Iverson’s famous press conference. Coach wisely said, “If you don’t practice, you can end up in Memphis.” Nice. "Coach K is going to take us to the promised land." – On Team USA: the experience has increased his shelf life at Duke, and has been positive in every way. – After accepting a cozy from a student, Coach K joked, “Do wine glasses fit in these? I’m a big wine guy.” But not a big wine and cheese guy, hopefully. – “Coach is going to take us to the promised land,” said Captain Lance Thomas. Jake & Amogh collaborated on this article. Welcome to Crazie Talk – a fanblog written, edited, and produced by five Cameron Crazies. For us, Blue Devil hoops is a way of life. Read Crazie Talk for a unique look into recruiting, team trends, league analysis, and more!